Nicaragua is a country which you can spend a week and still you want to keep exploring, but with our 3 day 2 night Nicaragua Vacation Package you will visit the main attractions. - Granada is the perfect example of a colonial city; cobbled street, bright colours, magnificent churches, airy squares and great museums. - Nicaragua is known as the land of lakes and volcanoes. There are 19 volcanoes in the country and most of them are active, we Will vist one, Masaya Volcano. - With freshwater lakes aplenty and the second largest rainforest in the Americas, Nicaragua is regarded as the next great eco destination. Lake Nicaragua is a must-visit, where you can spend your day kayaking, paddleboarding, and swimming to neighbouring islets with the chance to spot spider monkeys, sloths and tropical birds. 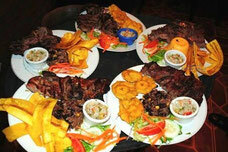 Do not miss it, visit Nicaragua! Depart early in the morning from your hotel in La Fortuna or the surrounding area by late model shuttle van to the border crossing at Peñas Blancas. There you will go through the necessary immigration processes and then continue on to San Juan del Sur, Nicaragua, one of the most preferred spots to visit for tourists in Nicaragua. Going to Masaya with its famous local artisans market is the next stop. Visit Masaya Volcano: in visiting Nicaragua on your vacation one of the most popular and most visited tourist attractions is Masaya Volcano. Located 29 kilometers from the capital this site is very emblematic in the country and is a spectacle of natural beauty. You’ll be able to observe all the surroundings from the summit due to the fact that the volcano is no longer active. In the afternoon we’ll arrive to the beautiful colonial city of Granada. 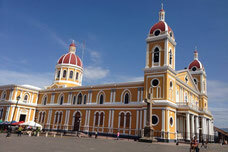 It is the oldest city in Nicaragua and one of the oldest on the American Continent. 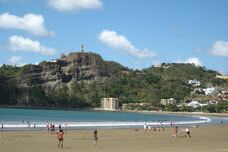 It is full of history, majesty, and culture and is the tourism capital of Nicaragua. Visit to Calle la Calzada for dinner with live music. Travel to the Lesser Islands of Granada: this archipelago of small islands is the result of the last eruption of Mombacho Volcano millions of years ago. There are a total of 365 small islands making for a magical spot on Lake Cocibolca. Full of natural life and vegetation you can appreciate an immense quantity of birds in their natural habitat. Start our return to Costa Rica. We will take you on to the site you indicate that you would like to return to be it a beach in the North Pacific like Tamarindo, Coco, or others or back to La Fortuna – Arenal Volcano area. This is an ideal vacation package to enjoy some of the most important places in Nicaragua. 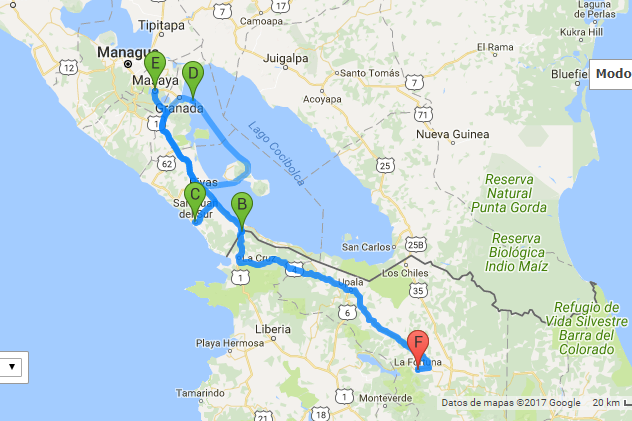 Price does not include entrance and exit taxes in Nicaragua which you pay at the border crossing. Price does include the $7 exit tax from Costa Rica. Tour includes: Lodging, food, and entrance fees to the aforementioned excursions. Specialized guide who will accompany you during the tour of both countries. Please fill out this form if you want to make reservation or if you need any extra information about the 3 day 2 night Costa Rica & Nicaragua Vacation Packages.